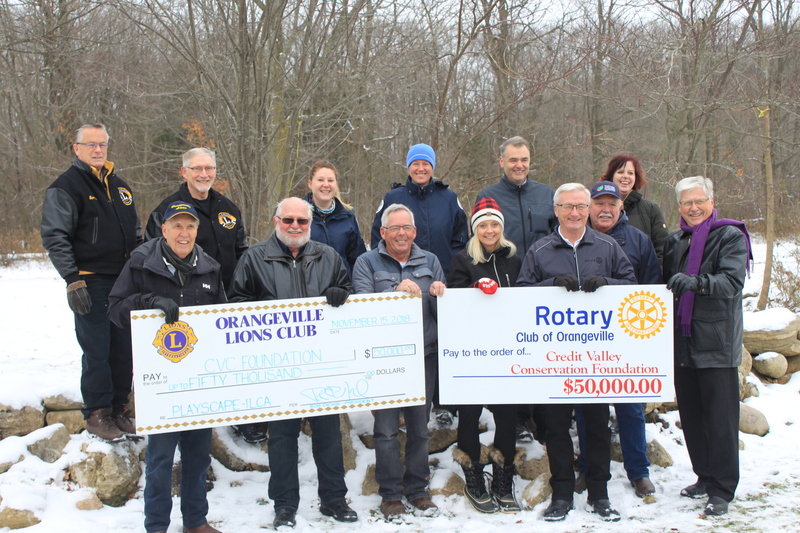 Credit Valley Conservation Foundation (CVCF) announced a $100,000 donation with local partners Orangeville Lions Club and the Rotary Club of Orangeville in a ribbon cutting ceremony held November 15, 2018 at Island Lake Conservation Area, Orangeville. Each service organization contributed $50,000 in support of a new natural playground project scheduled for construction at the park. The natural playground project will feature a new 1.17-acre nature-inspired play area at Island Lake Conservation Area. It will incorporate natural elements like plants, water, logs, boulders and terrain, with built play structure to provide different sensory experiences and types of play opportunities. The structure will be suitable for children ages one to 12 years old. “As we celebrate our 70th anniversary year of service in our community, we are proud to join with our Rotary friends and Credit Valley Conservation Foundation in developing this wonderful playground,” said Bob Dickie, Lion Chief of the Orangeville Lions Club. The playground will feature a short, accessible loop trail that joins to the Memorial Forest Trail. A series of smaller play pods will be accessible along the trail and feature nature-themed elements for a range of age groups. In the winter, the 2.5 metre-wide trail will be groomed and flooded for skating and skiing for the community to enjoy. This is the first major community project the Orangeville Lions Club and Rotary Club of Orangeville have partnered on. Total cost for the natural playground is expected to be between $175,000 and $200,000, half of which will be supported by today’s donation from each service club. The project has been led by Friends of Island Lake, in partnership with CVCF and Credit Valley Conservation. Credit Valley Conservation (CVC) is a local conservation authority established by the Ontario government in 1954 to protect, restore and enhance the natural environment of the Credit River watershed. That watershed is the area of land where all rainfall, snowmelt and runoff drain into lands and waters flowing into the Credit River. CVC creates connections between people and nature, knowledge and action. It inspires a deep appreciation for the role of nature in keeping people connected, healthy and happy. CVC is a member of Conservation Ontario. Back row left to right: Spencer Finch (Lions Club), Barry Sinclair (Lions Club), Meghan McIntosh (CVC), Yasmine Slater (CVC), Jeff Payne (CVC) and Lisa Taylor (Friends of Island Lake). Front row left to right: Dave Ferrier (Lions Club), Bob Dickie (President, Lions Club), Fred Murphy (Rotary Club), Terri LeRoux (CVCF), David Proctor (President, Rotary Club), Mike Walker (Friends of Island Lake) and Don Voisey (Rotary Club).